But the correct Vidhi of this Maha Mantra is not known to many. only a very few people know the correct Vidhi, which I am posting and it is an extremely rare and powerful Vidhi. By performing this Vidhi you will feel intense energy in your body, there will be a divine radiance on your face and body. Prabal Tej will be there in eyes of the Sadhak and he will get Vacha Siddhi and the immense blessings of Lord Shiva and many more benefits can be received, which will only be experienced by the Sadhak and cannot be described in words. All take this Mantra lightly but today a very rare and correct Vidhi is given to all the readers and Sadhaks so make your lives better this Sawan. Firstly find an isolated Shiva temple where there is no disturbance or if unable to find one, then find mud from a snake burrow and make a Shivling from it and do proper Pran Pratishtha of the Shivling. Then when this is completed start the Sadhna from Monday. Firstly do Panchopchar Puja of lord Shiva. Then, do Guru, Ganesh and Maa Parvati Puja. Use Kush Asan and spread Bel Patra leaves on the Asan and then sit on that Asan for the Mantra Japa. Keep a washed Bel Patra in your mouth while doing the Japa. Use a Rudraksh Mala for the Jap and the Jap must be Upanshu Japa. Apply Bhasm Tilak on your forehead or Tripund and also apply Bhasm on your arms. Before starting the Jap take a Sankalp that your are doing this Jap for Kripa Prapti of Lord Shiva and you will complete the prescribed number of Mantra Chants. The Jap Sankhya should be the same daily and you can decide according to your capacity how much Jap you want to complete. 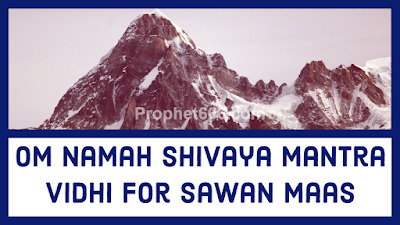 At least 125000 Mantra Japs should be completed during the Sawan Season or you can decide the number of days, but the daily Mantra Chants should be the same. FOR DETAILED VIDHI YOU CAN ASK A PRIEST OR A PANDIT FOR THE SANKALP VIDHI. After the daily Mantra Jap Vidhi do Abhishek of Shivling and pray for success to Mahadev. You can divide the Mantra Jap in 2 sittings one in the Brahma Muharat and other at night time. This is the full Mantra and will count as 1 chant on one Manka. You have to chant Om Namah Shivaya, while exhaling and Om Shivaya Namah, while inhaling, this is Anulom Vilom Mantra Prakriya. After the Mantra Jap before getting up from the Asan do Dhyan for about 5-10 minutes and leave some water under your asan and apply Tilak from that before standing up. Maintain Bramhacharya and all other Yam Niyams during the period of the Mantra Sadhana. This is a Sadhana and not a Prayog so it seems somewhat difficult. Sadhaks should do 12 lakhs Japs, but its according to ones own capacity so decide how much you want to do and take the Sankalp accordingly. You will get all the benefits, I have mentioned above and many other benefits from this Sadhana, which cannot even be imagined and as you will reach 21000 Mantra Jap you will start feeling Urja in your body and it will increase thereafter with every Mantra Chant. Guruji, As far as I know, the anulom vilom mantra is Om namah Shivay, Shivay Namah Om. Please comment. Mujhe jaanna h k kisi b kavach ko jaise laxmi narayan kavach ya saraswati Karachi ko dhaaran karne ki kya vidhi h,kb tk krte rhna hoga aur aapko kaise pta chalega k vh kavach sidh ho gya .plzz btaayein.